This adage doesn’t apply to every task we’d rather not do. In fact, there are many times that the best way to overcome procrastination is to cross the task off your list altogether, but we’ll leave that discussion for another day. Instead, let’s focus on those tasks we dread but cannot avoid. I have one of those coming up and if I want to do my day job well, there is no way to avoid it or cross it off my life. I have to face it and go through the experience no matter how unappetizing it feels. At the beginning of February, I have a conference to go to. The sessions don’t really appeal to me and I have to leave the conference early due to other commitments at home. So, in a discussion with my boss, we decided that my objective for the conference is to meet as many people as possible in similar positions as me. It’s pure networking and I hate it. When I ran my own business, it was the one thing that would make me want to stay in bed hiding under the covers. It was this weakness that limited the growth of my business. I’m not a meet-and-greeter. I don’t like and have a hard time doing small talk. But in this case, what’s best for our company is that I get to know my peers in other parts of the country. Being an introvert, the idea of putting myself in front of total strangers and interacting with them horrifies me. And yet, I know it’s what I need to do. Fortunately, there are many tools to help me. 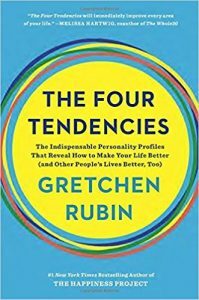 Apart from Rubin’s The Four Tendencies, there are a whole slew of books on being an introvert in an interactive world that can help me push through the dread and reach the other side where satisfaction and success wait. How do you deal with tasks that you simply can’t put off?